Hauppauge Digital has released the WinTV Nova-TD: a TV USB stick with Antenna Diversity technology to improve TV reception in marginal Freeview areas. 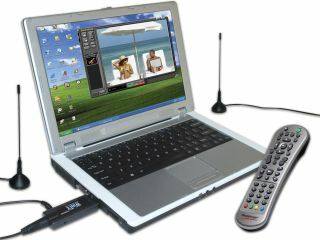 The WinTV Nova-TD allows two aerials to be connected to the built-in tuners, combining the signals to boost reception. In stronger reception areas, the Diversity technology can enable reception on the move - such as in a car or train - up to a theoretical maximum speed of 100 mph. When connected to two aerials with good reception, Hauppauge's Diversity stick can also operate as a twin tuner, allowing owners to watch one channel whilst recording another to hard disk. The Nova-TD Stick is supplied with two high gain indoor aerials. It costs £80, and is available immediately. The Diversity stick is compatible with Windows XP, but owners of Windows Vista PCs will see the message "tuner not installed" if they do not have the appropriate hardware. This problem can be fixed by downloading a patch from the Hauppauge website.